NEW Introducing 45+ Presentation Style Sketches & Details! Fill Mens flat drawings with color & fabrics FAST without joining paths – Live Paint friendly! Welcome to Men’s fashion technical drawing made easy! 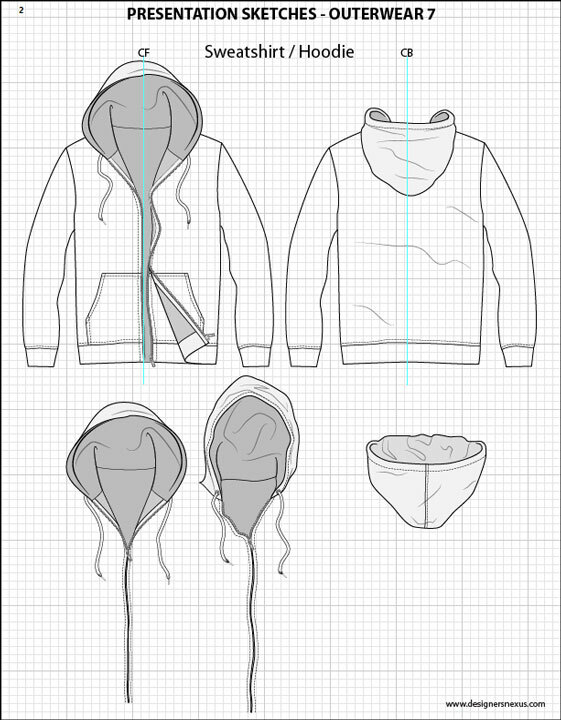 Adobe Illustrator flat fashion sketch templates developed to reduce flat sketching time specifically for menswear designers! There just never seems to be time in the fast-paced, deadline-driven fashion industry! Flat sketches are no exception, and designers often rush to get their menswear flats finished. It’s not uncommon to be asked how many technical fashion drawings you can sketch in a day or even an hour! If you’re starting each flat drawing from scratch, or sifting through flat sketch archives to find a similar style to start from, then you’re spending way more time on fashion flats than you have to! We’ve pre-drawn tons of mix & match menswear fashion flat sketches in Adobe Illustrator format, so that YOU won’t have to! Our Mens Fashion Sketch Templates have everything apparel designers need in one place for quick flat sketching of just about any fashion design idea you can think of! 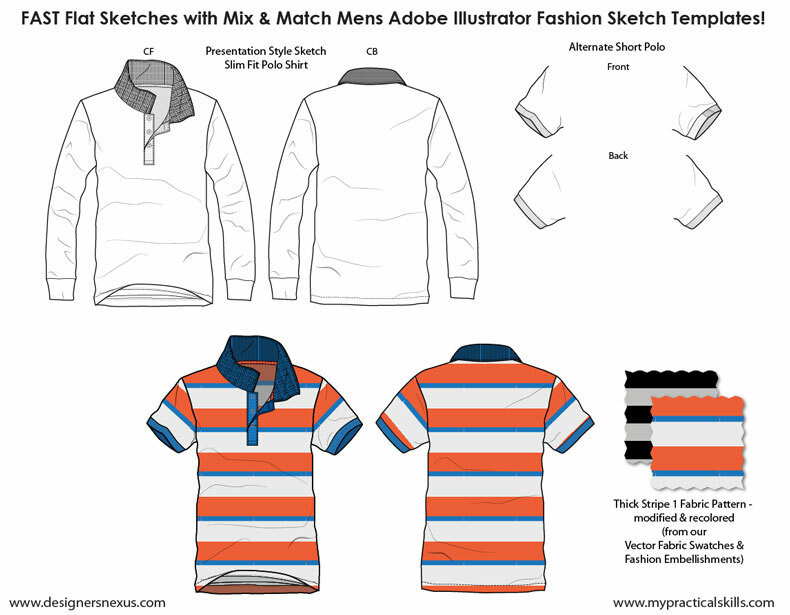 Adobe Illustrator Men’s Fashion Sketch Templates contains mix & match vector flat sketches for a full range of menswear apparel (shirts, pants, coats, jackets, etc.) and corresponding garment details (sleeves, collars, pockets, waistbands, etc.). Easy to Use: All Adobe Illustrator Mens Flat Sketch Templates are drawn with careful attention to placement of anchor points, grouped objects, and guidelines at CF & CB, so they are simple to use, edit, and fully customize to create various menswear apparel designs. Make your life even easier by combining these Mens flat drawing templates with our other Illustrator fashion templates to effortlessly create detailed fashion flats and stunning CADs & fashion presentation boards! Our Adobe Illustrator flat sketch templates are perfectly compatible with our Adobe Illustrator Fashion Brushes, Vector Garment Accessories, Illustrator Sweater Brushes, and Fabric Swatches & Fashion Embellishments, which are also drawn at 1/8th scale. Variety of Sketch Styles: Our Mens sketch templates now include “Technical” and “Modern” sketch styles, so you can choose the style that works best for your design needs! Technical style sketches are dawn with a traditional look and more accurate width dimensions that are ideal for showing graphics placements, detail callouts, etc. on spec sheets and tech packs. Modern sketch style sketches have a slimmer look that is often seen in presentation boards, line sheets, and portfolios. No matter which sketch style you need, our mens flats are drawn to be both professional & aesthetically pleasing, so your fashion portfolio, presentation boards, and tech packs will look clean and professional. You’ll impress prospective employers and freelance clients every time! All Mens flat sketches in this library are drawn with true length proportions at approximately 1/8th (8x’s smaller than actual size), so it’s easy to sketch design details and placements based on real dimensions. At 1/8th scale, 1 grid square = 1 inch. 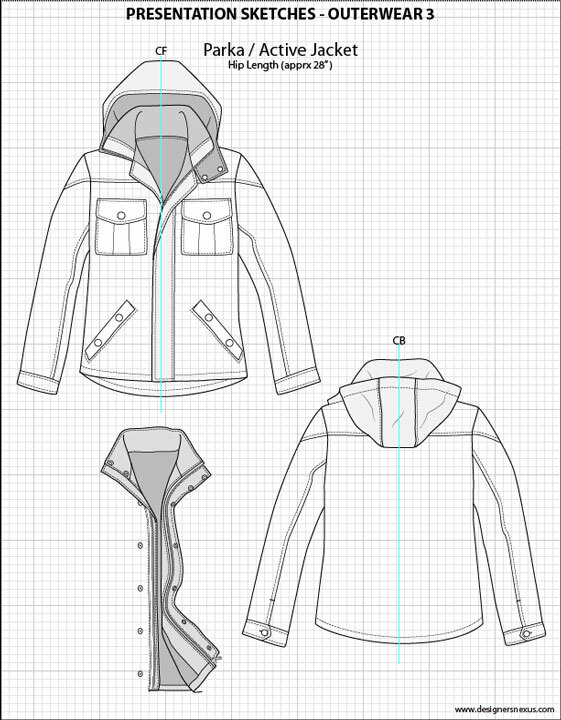 For example: to draw a 28” long jacket, just count 28 grid squares on your screen. Enlarging mens sketches to show accurate artwork layouts for graphics, pockets, etc. is a snap: Let’s say you’re creating a t-shirt graphic that is 15” wide, simply scale the artwork 8x’s (800%) to create the actual size artwork for your factories. Consistent sketch size & proportions allows you to place multiple fashion flats on a presentation board or portfolio page without wasting time trying to resize them all to the same scale! Each Menswear flat fashion sketch template is sketched to fit with one another, so you can simply mix and match silhouettes and garment details to quickly draw mens fashion technical drawing. It’s like paper dolls for flat sketches: just choose the body silhouette you want and pair it with mix & match sleeves, pockets, necklines, waistbands, and other garment details to sketch mens fashion flats in no time! And with over 1,045 menswear flat sketch templates to choose from, the design combinations are endless! All Menswear fashion flat sketch templates are Live Paint friendly, allowing you to fill flats with color & fabrics FAST, and eliminates the need to join paths or create closed shapes! (Free Live Paint tutorial included & watch this quick video demo). Easily stored on a flash drive or cloud storage for quick access at home, on the job, in the classroom or anywhere. Our Illustrator mens flat sketch templates are a great travel library that is perfect for freelance designers, fashion students, and any on-the-go menswear designer! We’ve compiled 26 useful Adobe Illustrator brushes drawn at the perfect scale for menswear flat sketches. This bonus Mens Illustrator Fashion Brushes includes zipper brushes, topstitching, and other stitches and trims that are often used for mens apparel. Create a new document – this is where you will “draw” your mens flat sketch. Open a Body file (ex. Tops Bodies, Pants Bodies) and select the silhouette sketch of your choice along with any corresponding details you wish to use (ex. sweep, waistband, cuffs). Copy the selected body sketch and Paste it onto the new document. Now open a detail file (ex. Sleeves, Collars) and select the desired garment detail(s). Copy/Paste the selected detail into the document with your body sketch and place the apparel detail in its’ appropriate position over the body. Continue adding garment details until you’re happy with the design. Now your fashion flat sketch is complete! While this set of mens Illustrator fashion sketch templates makes it easier for designers to draw menswear flats and will save you hours of flat sketching time, it is NOT intended as a substitution for knowing how to use Adobe Illustrator! 1,045+ Mix & Match Adobe Illustrator Flat Fashion Sketch Templates for low Introductory price of only $39.95! Awesome Templates!! they have saved me so much time in the design process. one of d best works…… good.. really good….